While it sounds simple, the Build Measure Learn approach to product development is a radical improvement over the traditional Waterfall model used throughout the 20th century to build and ship products. Back then, an entrepreneur used a serial product development process that proceeded step-by-step with little if any customer feedback. Founders assumed they understood customer problems/needs, wrote engineering requirements documents, designed the product, implemented/built the hardware/software, verified that it worked by testing it, and then introduced the product to customers in a formal coming out called first customer ship. Waterfall Development was all about execution of the requirements document. While early versions of the product were shared with customers in Alpha and Beta Testing, the goal of early customer access to the product was to uncover bugs not to provide feedback on features or usability. Only after shipping and attempting to sell the product would a startup hear any substantive feedback from customers. And too often, after months or even years of development, entrepreneurs learned the hard way that customers were not buying their product because they did not need or want most of its features. Best practices in software development started to move to agile development in the early 2000’s. This methodology improved on waterfall by building software iteratively and involving the customer. But it lacked a framework for testing all commercialization hypotheses outside of the building. With Agile you could end up satisfying every feature a customer asked for and still go out of business. The minimum viable product you’ll need to build to find the right customers is different from the minimum viable product you need for testing pricing, which is different from an MVP you would build to test specific product features. And all of these hypotheses (and minimal viable products) change over time as you learn more. 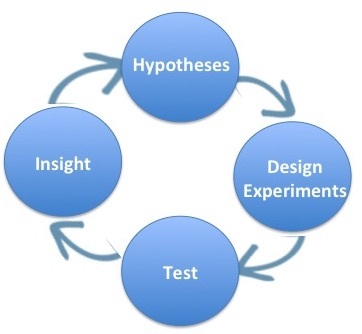 So instead of Build-Measure-Learn, the diagram for building minimal viable products in a Lean Startup looks like Hypotheses – Experiments – Tests – Insights. And it brings us to the definition of a startup: A startup is a temporary organization designed to search for a repeatable and scalable business model. The Customer Development process is a simple methodology for taking new venture hypotheses and getting out of the building to test them. Customer discovery captures the founders’ vision and turns it into a series of business model hypotheses. Then it develops a series of experiments to test customer reactions to those hypotheses and turn them into facts. The experiments can be a series of questions you ask customers but most often a minimal viable product to help potential customers understand your solution accompanies the questions. So another big idea here is startups are not building minimal viable products to build a prototype. They are building minimal viable products to learn the most they can. Finally, the goal of designing these experiments and minimal viable products is not to get data. The data is not the endpoint. Anyone can collect data. Focus groups collect data. This is not a focus group. The goal is to get insight. The entire point of getting out of the building is to inform the founder’s vision. The insight may come from analyzing customer responses, but it also may come from ignoring the data or realizing that what you are describing is a new, disruptive market that doesn’t exist, and that you need to change your experiments from measuring specifics to inventing the future. Great insights Steve. It’s like peeling the union. Every time you dig deeper in your model, it provides more insight on its workings. The magic of the model remains the circular motion (instead of the waterfall). To me Build-Measure-Learn still is the starting point, but I will definitely add the others as cards to the Lean Startup stack. Thanks for sharing! Thanks Steve, this has been such a problem that I have seen over and over again in the startup community. 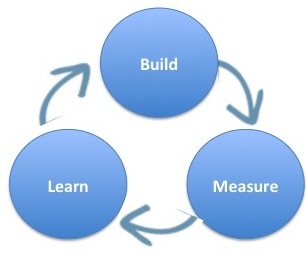 Many founders just build something and measure something and learn (of course, they do) and think it is a lean approach. Even worse, one group I know just changed beta to MVP in “alpha, beta, v1.0” and considered it to be a Lean Startup approach. 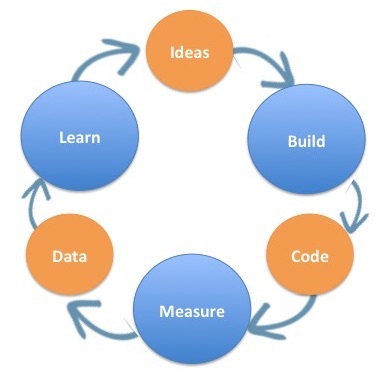 When I present “Lean Startup with Customer Development” I have been using a Hypothesis-Build-Measure loop, where founders formulate an hypothesis, build something to experiment with, and measure to collect data to validate (or not) the hypothesis. Steve, this is the most complete and succinct explanation I have ever heard you give. Thank you. Reblogged this on Chillik Media. I applaud Steve Blank for introducing the “HETI (Hypothesize-Experiment-Test-Insight) Loop” as an improvement of Eric Ries’s BML (Build-Measure-Learn) Loop. However, there are still some missing parts to be added to the HETI Loop. I’m assuming that the HETI Loop as well as BML Loop are summary descriptions of the process of Scientific Problem Solving or “Scientific Method.” Based on that assumption, scientists don’t just conjure or postulate hypotheses. Based on my experience, scientists first “Observe” and then “Think (Explore)” before “Hypothesizing”, “Experimenting”, and “Reflecting (Insights; Lessons Learned).” Using the first letter of each activity, this process of scientific problem solving can be summarized using the acronym, OTHER: Observe-Think-Hypothesize-Experiment-Reflect. Scientists without exception – from Newton through Einstein and Feynman and beyond – inexpensively and rapidly use the OTHER Loop to come with knowledge tools including scientific laws and theories. Like I said before, Steve’s HETI Loop misses some parts, that is, the “O (Observe)” and “T (Think).” The complete loop for scientific problem solving can be summarized using the acronym, OTHETI; this acronym sounds like a mouthful. Admittedly, I prefer the OTHER Loop which not only is ear-friendly but also has the connotation of doing things creatively by: Observe different; Think different; Hypothesize different; Experiment different; Reflect different. Although learning are problem solving are two sides of the same coin, focusing on a paradigm of “Emergent and Deliberate Problem Solving” rather than “Organizational Learning” can resolve most of the apparent conflict in Lean Startup theory, processes, and tools. I’m looking forward to a simpler visual process of describing scientific problem solving in the Lean Startup community. 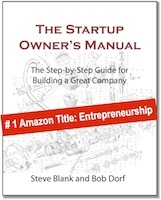 Great explanation on going deeper into the Lean StartUp process. However, the challenge is, too many people just want a checklist of things to do in order to be successful – “If I follow steps 1-10, then I’ll be successful”. 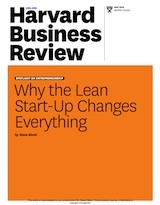 To really understand the underlying concepts of the Lean StartUp, one must first understand the foundational principles of Lean Thinking – Value, Value Stream, Flow, Pull, and Perfection. It’s all about continuously trying to improve the product, service or process you are working on. It’s as much a mindset as it is a formal process. Great points Glenn, but just to be clear for people who are reading, it’s not the development of product/service/process that one is selling that they should be trying to be lean about (value, value stream, flow, pull etc. ), although that is ultimately important too. During startup stage, it is the search for the repeatable, scalable, and viable business model that needs to be lean, i.e. don’t waste time and resources on anything that doesn’t help with validate learning. As is often said, “your product isn’t the product, the product is the business model.” All IMHO, of course. This sounds exactly like the Deming Cycle, minus the first phase of planning. Have you considered modeling something based on the full OODA loop? Thanks for touching on the topic. Of late I have been sharing Design related topics to the entrepreneurs on my meetup group. I am starting to feel there is some value of directly using the principles of Co Design, Service Design, Eco Deisng etc at the business level. ie how we organise the entire business – instead of organising a business around functions. 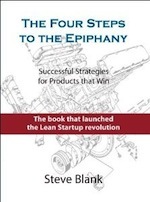 The lean startup, BMC approach are a step in this direction, but donot seem to cover the strategy / operation interplay needed to accurately realise the vision (Clausewitz). eg operational timelines, risks, complexities, stages of the uncertainty funnel, etc. seem to not be covered. Be great to have some of your thoughts on this. Really insightful! And I also find much easier to live with a ‘failure’, if I see it as the result of a wrong hypothesis instead that the consequence of a bad idea. Excellent articulation of MVP .. i.e., It is not about building ‘stuff’ (With so called bare minimum features) and throwing it on the other side of wall to capture the market , rather it is a ‘simplest’ thing that we can show to potential customers to get the most learning at that point in time. Thanks a lot Steve for your thoughts on the Lean principles. Great update, thanks Steve. Since this is a discussion about better terminology to reflect customer development ideas, one question I’ve had about the terminology you use – why call these people who are the target of a founder’s experiments “customers”? They have usually neither bought nor received anything during early stages, and they have usually not committed to buying anything. At best they are “prospects” or “target audience”. I see many founders who swear by the Lean Startup methodology forget the difference between a real “customer” and a “prospect”, which can be quite fatal IMHO. Prospects may at best have expressed interest in the problem/solution but can take ages to convert to customer/user, and have low conversion rate in a majority of cases. I completely agree. It’s sloppy terminology on my part. In fact, I remind startups I advise of exactly this point – they’re prospects or target audience until they buy or activate. Hey Steve, thanks for the article. Again, great content. I’m seeing six parts on the diagram. Was this a typo, or am I missing something? If it was intentional, would you mind explaining, which five parts? Really insightful, thanks for this Steve. 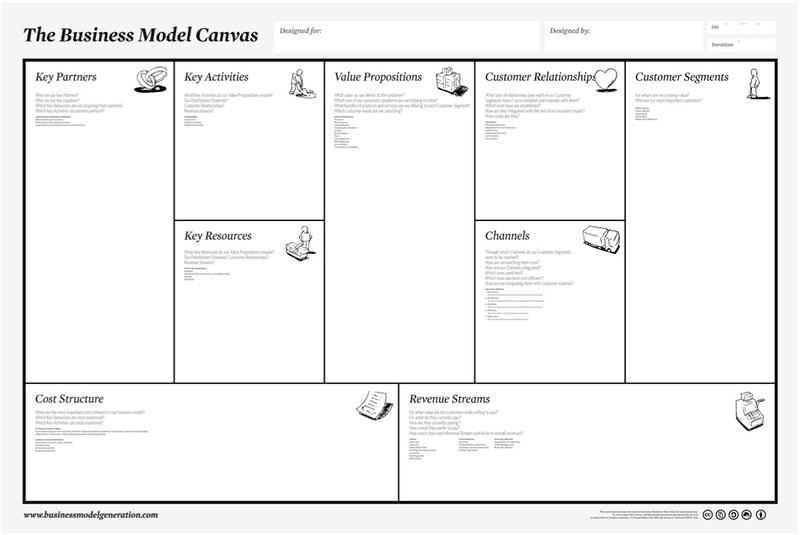 Thanks, Steve for continuing to support the initial Business Model Canvas as a structure for start-up experiments. I attempt to guide Startups utilizing other Canvas variations into the BMC as a” lingua franca” for drawing out the required info.